Location: Underneath the John F. Kennedy Bridge, on River Road in Louisville. 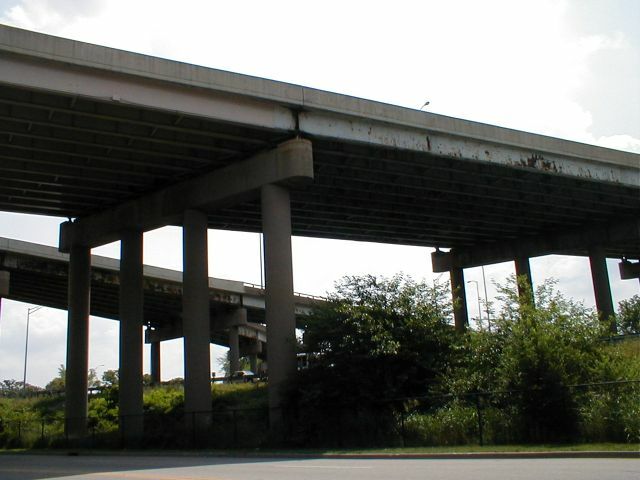 This is a view from underneath the Spaghetti Junction interchange between Interstate 64, Interstate 65, and Interstate 71 in downtown Louisville. This photograph was taken by Jeffrey Carlyle on July 6, 2003. This picture has been scaled to 50% of its orginal size. If you would like the orginal, larger image, please contact Jeff.